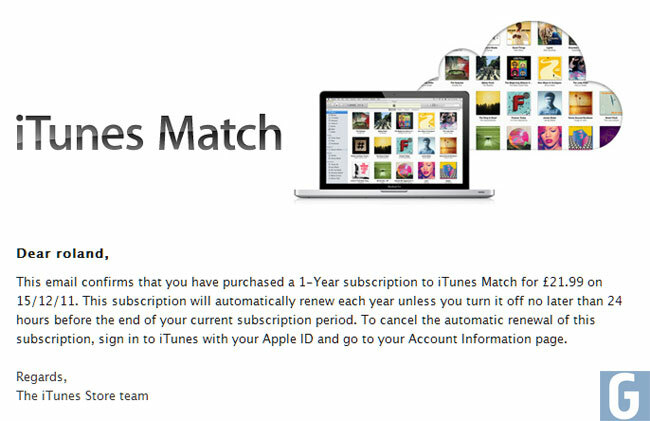 It looks like Apple’s iTunes Match is about to launch in the UK, we heard earlier that some users reported it was available, and then it was removed, I just logged into my iTunes account and was able to sign up for a subscription to iTunes Match in the UK. The service costs £21.99 a year here in the UK, and it doesn’t look like you are able to use iTunes Match as yet, although I was able to purchase it and received an email from Apple confirming that I had subscribed to iTunes Match, which you can see below. We suspect iTunes Match will be available to everyone in the UK and Europe later today, if you have subscribed to it and have managed to get it working leave a comment and let us know.